Ingolstadt Manching Airport, or Fliegerhorst Ingolstadt/Manching in German (IATA: IGS, ICAO: ETSI), is a military airbase with civil usage located in Manching near Ingolstadt, Germany. The airport is home to the Bundeswehr Technical and Airworthiness Center for Aircraft. Cassidian, the defence and security subsidiary of EADS, also has its headquarters here. The first flights of the Tornado and Eurofighter prototypes took place here. The F104 and the F4 were flown here testing weapons systems in the 1960s, 70s and 80s. No scheduled flights are offered to and from Ingolstadt Manching. Private Wings offers some business charter flights on demand across Europe. Ingolstadt Manching also receives frequent charter flights from Braunschweig-Wolfsburg Airport transferring personnel of the Volkswagen Group between their headquarters in Wolfsburg and their subsidiary Audi in Ingolstadt. Airport information for ETSI at Great Circle Mapper. 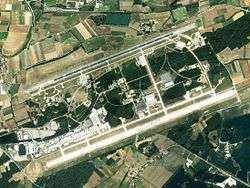 Airport information for ETSI at World Aero Data. Data current as of October 2006.